NBA Playoffs get underway this Saturday. The 2018 NBA Playoffs will get underway this Saturday, April 14th following last night's regular season finale in which several teams were jockeying for position and, in some cases, a spot in the post-season. Without further adieu, here is what the Eastern and Western Conference playoffs matchup look like for the first round. The NBA Playoffs will officially tip off at 3:00pm on Saturday, April 14 at Oracle Arena, the home of the defending champion Golden State Warriors. That game will air on ABC, but the rest of Saturday's action can be seen on ESPN. This includes the Toronto Raptors hosting the Wizards at 5pm, followed by Miami at Philadelphia at 8pm and the Pelicans visiting the Portland Trail Blazers in the night cap. Sunday's games will be split between TNT and ESPN, starting with the Bucks vs Celtics at 1pm on TNT, followed by the Pacers at Cavs at 3:30pm on ABC. The two night games, Utah vs OKC and Minnesota at Houston will both air on TNT. 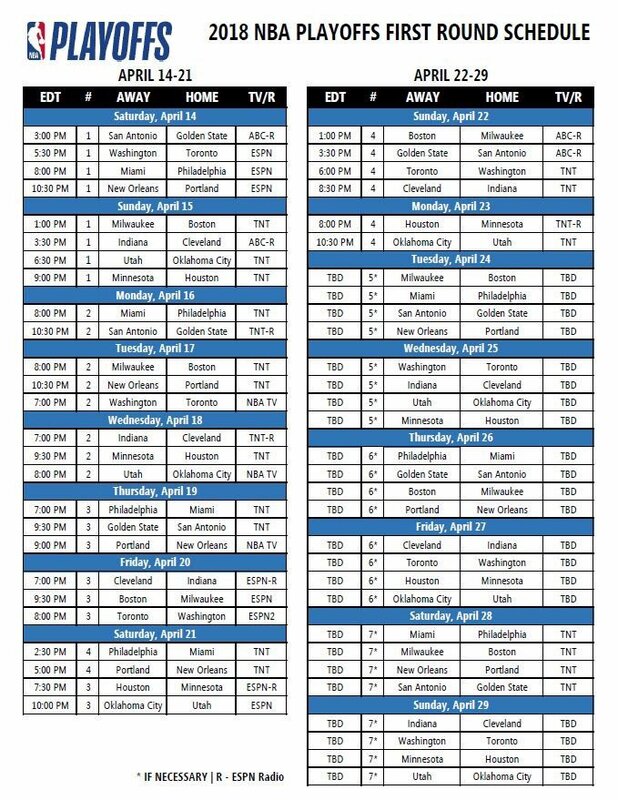 Take a look at the full first round schedule for the 2018 NBA Playoffs below.